Makes me crave a Tofutti Cutie every time I journal! So here’s the deal: I kind of love this journal in spite of myself. 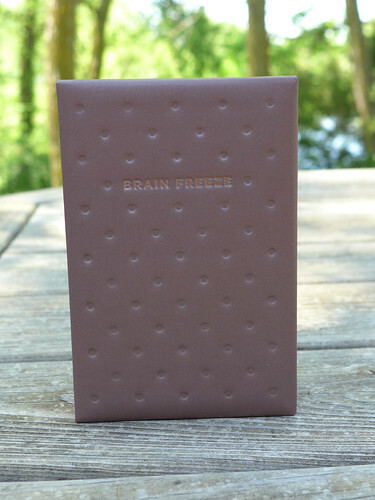 Like many of Potterstyle’s journals, Brain Freeze is small: 4.1″ wide by 6.1″ tall, and a whopping 1.4″ thick. The teeny tiny pages + the thickness of the book makes it quite difficult to write in: my hand starts to fall off the bottom of the page a mere 1/3 of the way down, and it’s such a long drop that it’s a struggle to continue. My handwriting’s bad enough without the extra help, thanks! It’s a mystery why they design the books this way. So they can easily fit in your pocket or a purse? But who wants to carry their journal into the world, where it can get lost or stolen? I’d much rather have a journal that’s comfortable to use, you know? Even though I knew I’d end up loathing the dimensions, I just had to have this journal. 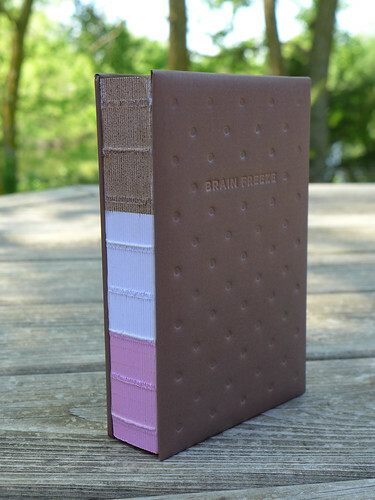 Ice cream is literally my favorite, and this book looks so much like a Neapolitan ice cream sammie that I salivate a little every time I look at it. 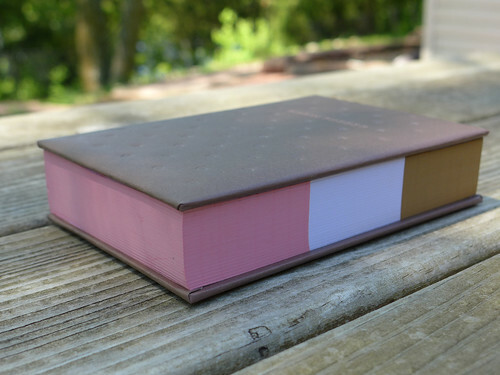 The outer edges of the pages are colored chocolate, white, and pink. 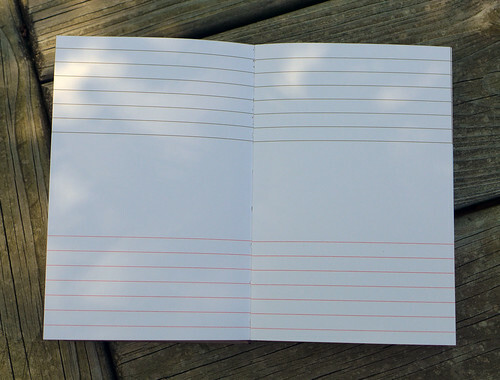 While the pages themselves are white (obvs), the lines inside are dyed to match the theme. Weirdly, this means that the middle section is one huge blank space (white on white = all-white). I guess you could use it to highlight much-loved quotes or important thoughts? Either way, the lines are spaced 1/4″ apart (similar to college ruled), with a 2″ gap in the middle white area. The brown cover is stamped with dots, similar to the cookies in an ice cream sandwich, to complete the look. Before ordering I worried that it might be made of leather – I’m a vegan – but now that I have it in my ends, I’m pretty sure it’s a high-end, fancy-pants cardboard. It has a luxurious, smooth feel. The journal’s title is also embossed on the cover in a yellow-gold, all-caps font. The whole thing feels quite rich, much like a sundae, or maybe some homemade cookie butter ice cream. I’m not 100% sure of the genesis of this particular ice cream flavor, but I think it had something to do with carrot cake ice cream. As in, I really wanted to give it a try, but was one tub short of plain cream cheese for the icing swirl. Plain Tofutti cream cheese got me thinking about Daiya’s amazaballs strawberry cream cheese, one thing led to another, and – huzzah! 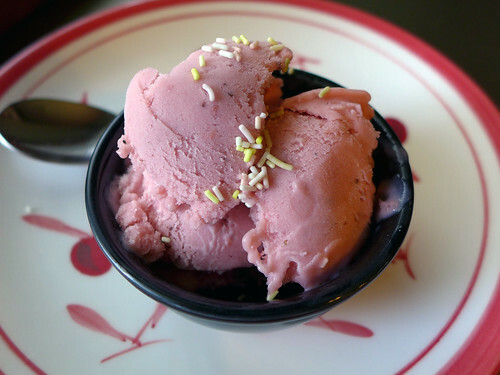 – strawberry cream cheese ice cream. Just in time for Valentine’s Day. Initially I thought that a cream cheese swirl/chunks of cream cheese a la cookie dough would be the ticket, but not so much! 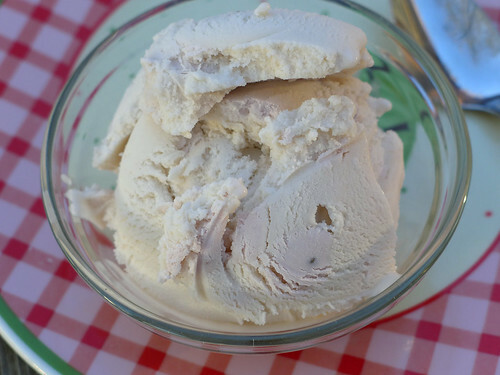 Solid cream cheese doesn’t freeze as well as ice cream batter and besides, I think the cream cheese flavor tastes better when evenly distributed throughout the ice cream rather than concentrated in little bites. Luckily my ice cream maker did such a thorough job of mixing the cream cheese with the batter – even when added near the end of the cycle – that I ended up with very few chunks. My advice is to add the cream cheese as soon as the batter’s poured. 6 ounces (or 3/4 of a tub) will give you a nice flavor, but if you’d like your ice cream extra cheesy, maybe try a full 8 ounce tub for maximum effect. If you’re really feeling adventurous and want to give chunky a try, add the cream cheese during the last few minutes of the cycle. 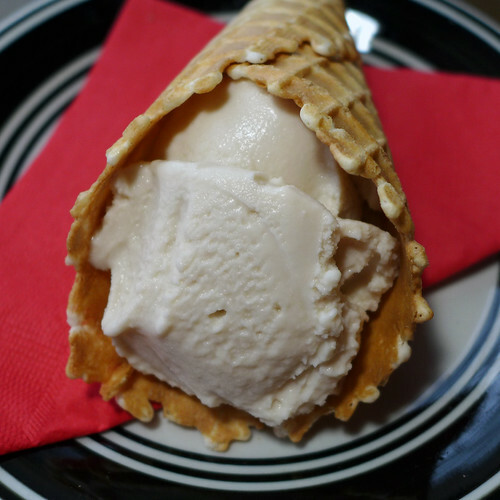 As much as I love banana ice cream (banana bread banana ice cream, you are the BEST! ), making it can be such a pain. Waiting for the banana slices to freeze and then defrost ever so slightly; prying and wedging and knifing them apart; processing and scraping and processing and scraping, as my food processor dances on the counter as though possessed, and the motor threatens to burst into flames. And then there’s always one or two big ole chunks of bananas that refuse to assimilate no matter how long you stand over the bowl, pulsing and cursing. Yeah. After years of this nonsense, I started to wonder: is there a better way? peel -> slice -> blend -> freeze. I hit the internets to find out and found a few people with the same question – but no answers. You know what that means: Experiment time! I tried the new method using just three bananas, to make a pint of nice cream (usually I go full-on quart). On the left is old school banana bread ice cream; on the right, newfangled chocolate cinnamon ice cream. Now that I’ve gotten to the point where I’ve tried nearly every dream ice cream flavor I can think of, it’s time to get creative – like, cleaning out the cabinets creative. Also, Shane and I are thinking about moving some time in the distant future, so it’s probably best to start lightening the load now. If you could only see my pantry, you’d understand. Out of control doesn’t begin to describe it. My skepticism re: expiration dates doesn’t make things any easier on the hoarding end. Exhibit A: the custard mix I bought roughly four years ago, back when I was reviewing Vegan Junk Food and wanted to try the Boston Cream Pie. It never materialized and so the custard powder sat. When I went rooting around in the cabinets for inspiration, I thought that surely someone must have tried to make ice cream with it. And they have! Usually with eggs and cream, but we can’t all be awesome, okay? Anyway, this is my vegan version. I’ve never had custard before, so I can’t rate the accuracy of its flavor. What I can say it that it tastes delish: a little vanilla-y, but with a little extra something that I can only assume is the custard talking. So this recipe required way more raspberry extract than I expected! The matcha powder completely overwhelms the raspberry flavoring, necessitating two teaspoons instead of one. I bet fresh or frozen raspberries (two cups, maybe? ), cooked down into a jelly, would work even better, but then you’ve got a Seed Situation on your hands. So if it’s a smooth ice cream you’re looking for, best stick with raspberry extract. This flavor pairing isn’t my all-time favorite, but it’s pretty good nonetheless. 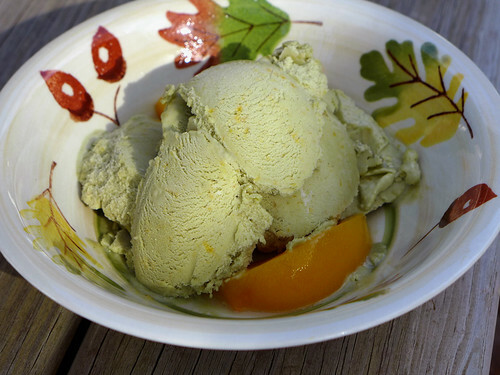 And if you eat a ton of green tea ice cream, it’s a fun way to mix things up without relinquishing the matcha. I wasn’t entirely sure how well this experiment would turn out; after all, raspberries are only like my third favorite berry, after blueberries and strawberries. They taste wonderful, but ALL! THOSE! PESKY! SEEDS! And seeing as the batter contains both raspberry extract and just the tiniest bit of preserves for added flavor, yeah. I worried that the seeds would ruin it. I like my ice cream like I like my doggy bellies – smooth and soft. As it turns out? This recipe is amazaballs. For the smoothest base possible, feel free to omit the preserves (and maybe even bump the extract up to a full 2 teaspoons) – but all told, the seeds are dispersed enough that they don’t entirely disrupt the silky smoothness of the ice cream. And then there’s the raspberry swirl, which is THE BEST. For a chunky, high impact feel, stir it in ever so gently; but for a more consistent vibe, be a little more vigorous when mixing. I usually eyeball the add-ins, and give you a range that you can adjust to your own tastes. Anywhere between 1/3 and 1/2 cup ought to do it though. Maybe even 3/4 cup if you’re feeling adventurous. I used red raspberry preserves, since I had a jar on hand, but you can always swap it out for your own homemade raspberry sauce. Just toss a few cups of berries in a medium-sized saucepan and cook on medium until jelly-like in consistency. The less moisture, the better! Remember this maxim and you can’t go wrong. At least when churning vegan ice cream, that is. After the awesomeness that was my Lemon Blueberry Swirl Ice Cream, I suppose it was only a matter of time before I started experimenting with various flavors of lemonade ice cream. I started with Strawberry Lemonade, because a) strawberries are my favorite and b) they are totally seasonal and c) bursting out of my fridge. I mean, strawberries! Hello! BEST. Just ask the Strawberry Shortcake bedsheets from my childhood. Okay, I’m meandering. The heat is totally frying my brain. Anyway, this recipe is pretty rad and you should totally give it a try. It’s extra-handy for those times when you went shopping with your stomach at the farmer’s market and “accidentally” bought more strawberries than you could possibly hope to eat. Pro tip: For a smoother ice cream, you can always process the cooked strawberries in a food processor or blender (using a splash of soy creamer or milk if too thick) prior to making the ice cream batter. However, I didn’t bother, assuming that the paddles on my machine would do a good enough job breaking up any remaining strawberry chunks. And they totally did! Alternately, if you like a few chunky bits o’ berries, hold a few tablespoons of the cooked strawberries back and add them to the machine about fifteen seconds before dispensing. Or mix them in by hand as you transfer the finished ice cream to a storage container. 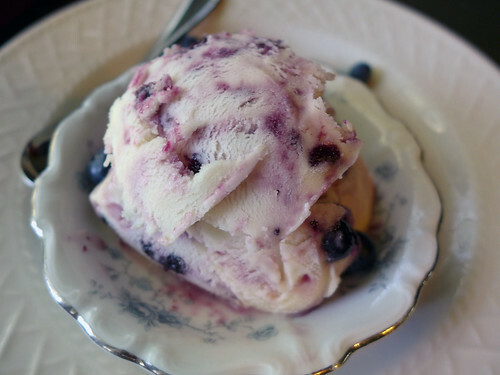 This particular flavor is inspired by a crazy delicious (and crazy expensive!) artisanal lemon blueberry jam I found on Mouth.com. (I won a certificate, so.) It last for all of two and a half bagels (tiny jar is tiny), which wasn’t nearly enough crush my craving. So what better remedy than ice cream? 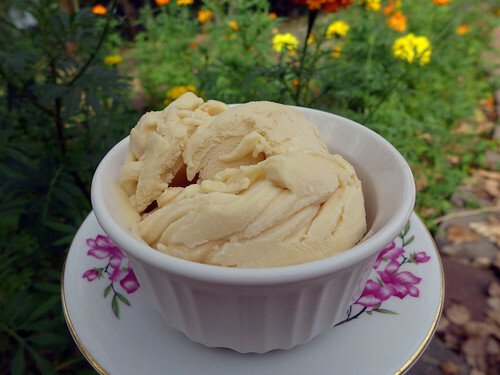 I wasn’t entirely sure how much lemon juice concentrate I should use; I turned to Wheeler Del Torro’s The Vegan Scoop for reference, and he only uses three tablespoons in his one and only lemon ice cream recipe (lemon basil, if I’m not mistaken). That seemed on the low side, so I doubled it. And then some. Right off the stovetop, it appeared I’d made a horrible mistake: the lemon flavor was over-the-top and way too tangy. But. After the batter cooled and was processed, the lemony taste mellowed somewhat. Plus the blueberry jam draws a little attention away from it. I think this configuration is perfect, but feel free to swap out 1/4 cup of the lemon juice for soy milk if you’d rather play it safe. When picking your blueberry jam, try to find a brand that has little chunks of blueberries inside. These frozen bits of goodness catapult the finished product from delicious to out of this freaking world. 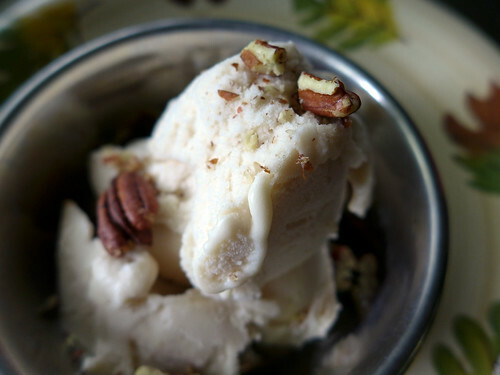 Recently it occurred to me that I’ve never made my own maple pecan ice cream – outside of banana ice cream, that is, which is delicious but doesn’t count. 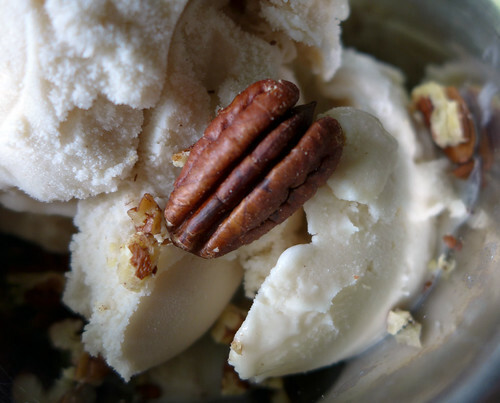 (You can always taste the bananas, so it’s not a true maple pecan ice cream – more like banana maple pecan ice cream. Good but NOT THE SAME.) This is weird because I’ve always been a fan of Tofutti’s Better Pecan ice cream. The good news is that it’s really easy to make; you just need maple syrup and pecan flavoring/extract for, well, flavoring. You can also mix in some roasted, crushed pecans if you’d like, but I opted to use them for garnish instead. 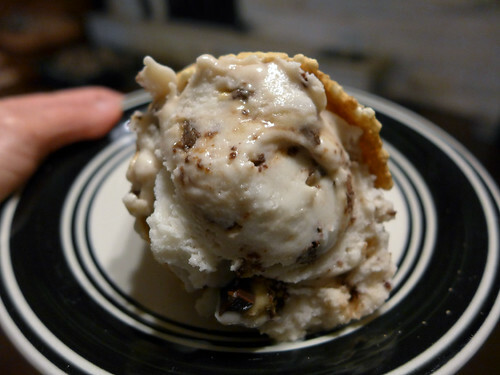 Nuts added directly to ice cream can get a little soggy and lose some of their crunch over time. Thanks, but no. 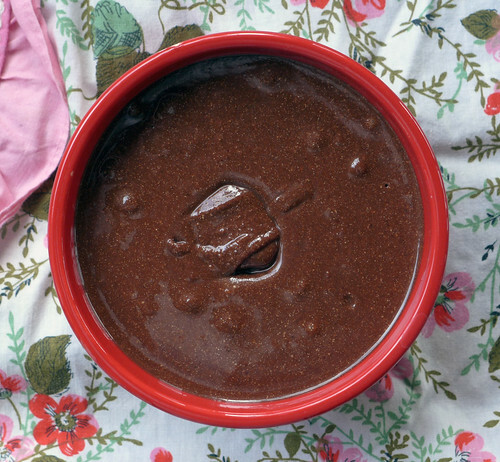 Making Not-tella with Hazelnut Flour and a Recipe for Vegan Nutella Swirl Ice Cream! Along with a giant honking bag of red quinoa, the nice people at IFS Bulk also gave me 48 ounces of hazelnut flour to play around with! Prior to this, it didn’t even cross my mind that hazelnuts might come pre-ground, flour style, similar to almonds, cashews, and the like. But they do! And of course I used the flour to make my absolute favorite: vegan nutella! So far the only recipe that’s worked for me is the Not-tella from Veganomicon – which, you might recall, I rocked to the Yeah Yeah Yeahs a few VeganMoFos back. Anyhow, it’s the only version I’ve tried that actually results in a readily spreadable, creamy nut butter. And while it can be a little tough on ye ole food processor, it’s 1000% worth it. 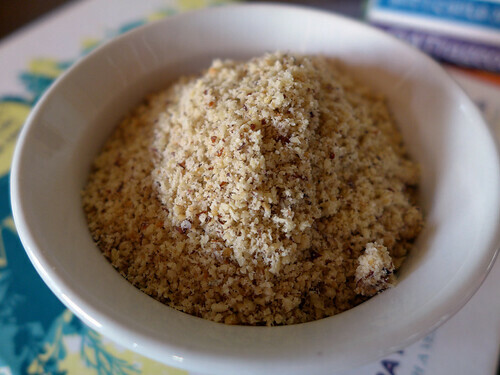 Still, I wondered if maybe swapping out the whole hazelnuts for hazelnut flour might make the process a wee bit easier? After all, it’s the whole filberts that really make my food process jump and dance and just generally send me into a panicky tailspin. Once they’re processed, things go much more smoothly from there. And you know what? Hazelnut flour FTW! Ooey, gooey, and spreadable at room temp. I made a couple of batches of Not-tella – one for ice cream, one for licking from the spoon – and each time the process was pain-free. I didn’t even have to take a break to let the motor rest. From now on it’s nutella with hazelnut flour for this girl. Okay, so this ice cream sounds a little sketchy, but it’s actually not half bad! 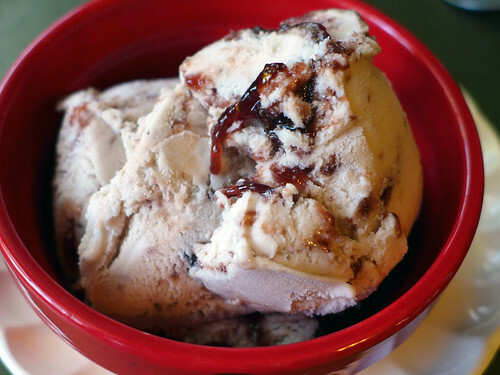 Probably you’ll opt for a dessert drenched in booze for the St. Patrick’s Day holiday – not that I would blame you; may I suggest this Kahlua ice cream? – but with the festive green color, I just couldn’t pass on the fortuitous timing. The seaweed powder is another superfood that I received for review from Kazu, hence the odd recipe. I only used a teaspoon and a half, though, so the taste is very subtle. It pairs surprisingly well with bananas, and the shocking green color provided by the spinach cuts down on the cognitive dissonance you might otherwise experience. Plus it’s hella healthy, so there’s that too. And if you use a raw seaweed powder and leave out the sugar and nondairy milk, I do believe that this recipe is a-okay for raw foodies. So…eat up? P.S. I am seriously considering changing my name to Ice Cream Star. Or maybe Unicorn Pizza Star. Something along those lines. Thoughts? 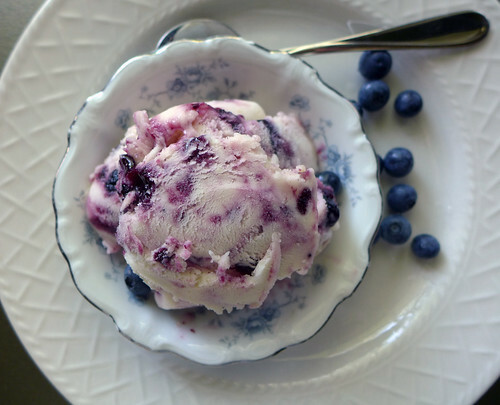 Like many of my recipes (especially ice cream recipes – though usually banana-based), this one was borne of a desire to clear out the fridge/freezer. (Spring cleaning, it’s about that time!) I had about a quarter of the messed-up Cashew Cappuccino Nanaimo Bar I made (or tried to make, rather) for Christmas sitting in the freezer, and I decided what better way to finish it off than mixed with ice cream? You can’t go wrong with ice cream. It’s just not possible. So basically I just chopped the leftovers up and stirred stirred them into a batch of vanilla ice cream post-processing: easy peasy! You can do this with pretty much any baked good you’ve accidentally-on-purpose made a little too much of: cookie batter, cupcakes, granola bars, truffles, you name it. While certain layers caught my attention more than others (namely the cashew cream and chocolate topping), the finished ice cream proved tasty enough that I’m thinking about turning these flavors into their own honest-to-goodness ice cream, no nanaimo bar required. I eat so much ice cream, y’all, that’s it’s difficult to come up with new flavors to try! This one was inspired by the Irish Cream recipe in The Vegan Scoop, which turned my attention toward the liquor cabinet, and the many wonderful boozy flavors I’ve yet to experiment with. I know that ice cream’s kind of out this season, but methinks this would make an excellent dessert for a vegan Christmas/New Year’s bash. And yes, Kahlua is vegan! 1. In a small mug, combine 1/4 cup of the soy milk with the arrowroot powder. Whisk well and set aside. 2. In a medium saucepan, combine the soy creamer, remaining soy milk, sugar, and 1/4 cup Kahlua. Heat on medium-high, whisking constantly, until the mixture begins to boil. Remove from heat and add the arrowroot slurry immediately, whisking well. This should cause the milk to thicken noticeably. Taste the batter and add extra Kahlua to taste. 3. Cover and transfer to a fridge to chill for six to eight hours or, better yet, overnight. 4. 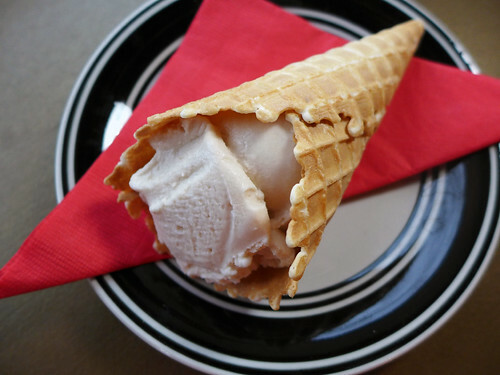 To make the ice cream, process the batter according to your ice cream machine’s directions. 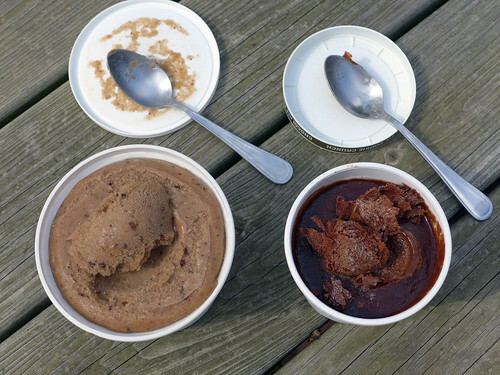 Enjoy immediately as soft serve or transfer to the freezer for a firmer dessert. This flavor was inspired by Purely Decadent’s Cherry Nirvana flavor which, according to the internets, has been discontinued. (Boo!) Not that it much matters to me; while Kansas City is home to a surprising number of health food stores (Whole Foods, Trader Joe’s, Green Acres, to name a few), their selection of vegan foods is uniformly sucky. Just before Halloween Shane trekked down to Overland Park in search of So Delicious’s holiday-flavored ice cream pops (Pumpkin Spice and Candy Corn), and he came home empty-handed. Also MIA: Amy’s Daiya Cheese Pizzas; Nayonaise; and Tofurky frozen pockets. WTF! 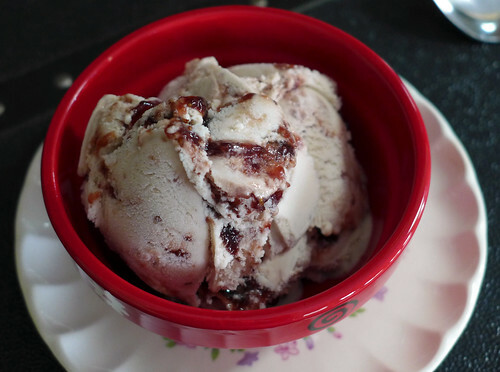 Anyway, this Chocolate Cherry Chunk Ice Cream is in Cherry Nirvana’s ballpark, but I came up just short of nailing it. The cherry flavor isn’t quite the same, possibly because So Delicious uses a higher-quality cherry extract than I. But the chocolate-covered cherry bits are gangbusters! Pro tip: you may want to make extra for snacking. The frozen ice cream proved difficult to scoop, but that was totally on account of the frozen bits of chocolatey goodness; the ice cream itself is smooth and creamy. 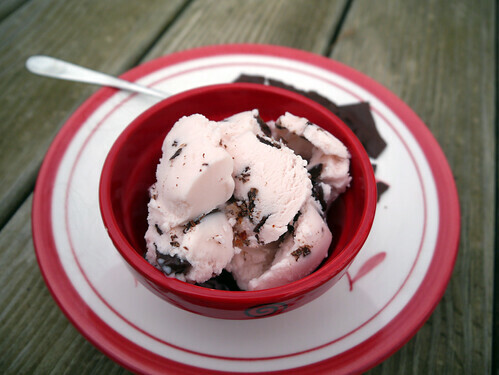 For easier scooping, you can set the chocolate cherries aside and sprinkle them atop the ice cream just prior to serving. Either way. Awesome. One of my all-time favorite flavors of green tea (second only to *maybe* jasmine) is peach. 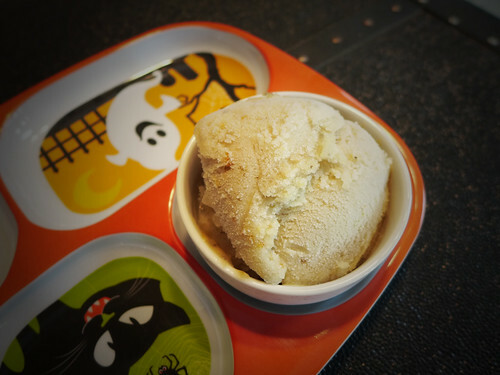 Recently it occurred to me that I’ve yet to make peach green tea ice cream, an oversight I took to rectifying immediately. Luckily, it was pretty simple: just process some canned peaches and syrup into a slurry and use it in place of the soy milk. Peach Green Tea Ice Cream in a jiff! If this was the beginning of summer, I might have used fresh roasted peaches in place of the canned stuff. Sadly, it is not. (Sob. Snow is just around the corner, y’all! Get me some sun lamps stat!) But feel free to use ’em if you’ve got ’em! Also, 1 1/4 cups (or 1 cup post-processing) is about six slices shy of a full 15 ounce can. I was tempted to use the whole shebang, but worried that it’d be too much batter for my one-quart machine to handle. It can be hard to tell, since some batter expands more than others when frozen. As it turns out, it fit with very little room to spare. If your bowl is larger than mine, go ahead and use the full can. Or don’t! The leftover slices taste amazing when served alongside the finished product. 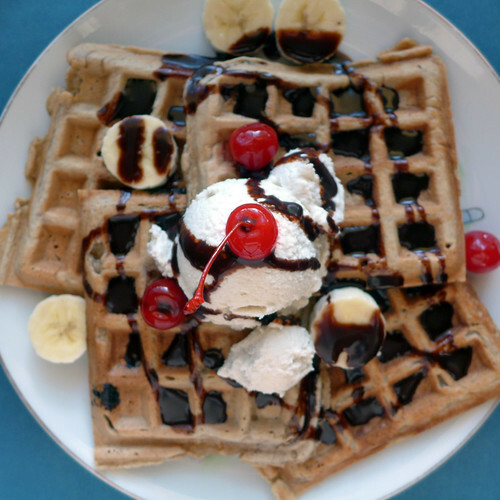 Waffle Wednesday: Banana Split Waffle Sundaes! Leslie Knope likes her waffles like she likes her Ben*: served in a short stack and smothered in whipped cream. For this year’s MoFo, I really wanted to recreate the gorgeous tower of whipped cream that always seems to find its way onto Leslie’s waffles. Unfortunately, none of the alternative food stores in my area carry the cans of SoyaToo whipped topping that would help me pull it off. (Or any vegan whipped cream, for that matter. Boo!) Instead I opted for the next best thing – making my own using coconut cream. I’ve been vegetarian since 1996, and went vegan in the mid-aughts. 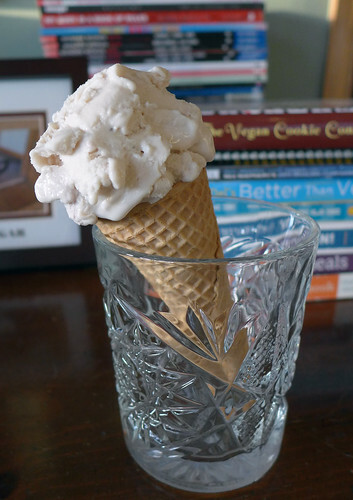 Along with vegan pizza, vegan ice cream is my absolute favorite – and have tumblogs dedicated to each to prove it. I own one ice cream maker (a Cuisinart Ice-45) and covet a second one (the KitchenAid Stand Mixer & Ice Cream Maker Attachment). No fewer than five vegan ice cream cookbooks line the bookshelves in my pantry. I’ve been allergic to milk my entire life (technically it’s galactose – milk sugar – that’s the problem, but same diff), and have never been able to have “real” ice cream. Growing up as I did in the 1980s, I still remember the Dark Days of vegan processed food: when vegetarianism was fringe and my mom bought my dad’s meatless links in the basement of the local Unitarian Church, and I was ecstatic to have two (TWO!) vegan ice cream options in the mainstream grocer’s freezer: Rice Dream (*shudder*) and Tofutti (which will forever occupy a special place in my heart). I’m a bit of a vegan ice cream connoisseur, is what I’m saying. I purchased Jeff Rogers’s Vice Cream way back in 2009, but as of yet haven’t tried a single recipe. For whatever reason (the abundance of cashews? the insistence on juicing everything? the multiple steps and machines required for each recipe? ), none of the recipes really appealed to me. 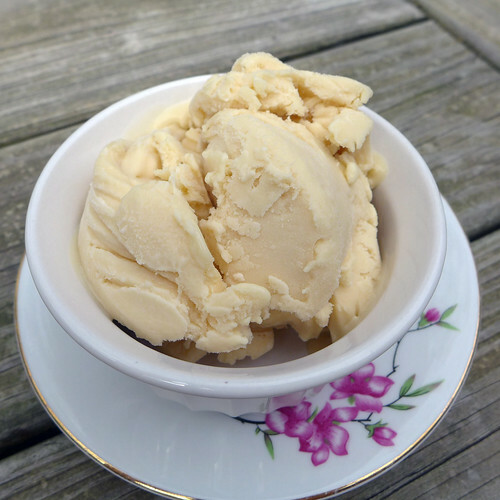 So when I spotted a new and revised edition – now called Vegan Ice Cream – on Blogging for Books, I decided to give it a try, in the hope that Rogers had tweaked his formulas. 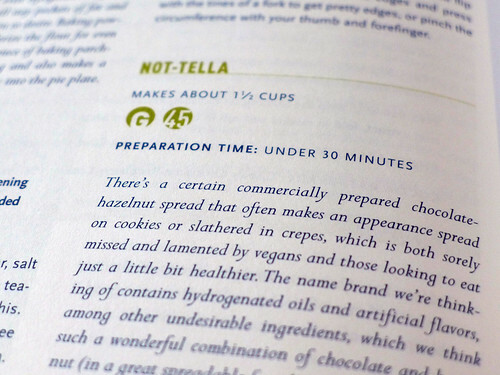 As it turns out, the updated edition contains twenty or so new recipes – along with the seventy originals – but all use the same bases found in Vice Cream. Hopes, dashed. Just scanning through the book, I had my doubts. 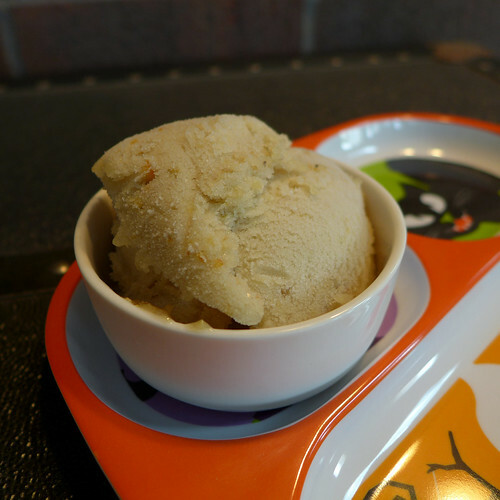 From my experience using cashews to make vegan cheeses, I could tell that they alone wouldn’t thicken the batter substantially, and certainly not to the pudding-like consistency needed to make a smooth, dairy-like ice cream. 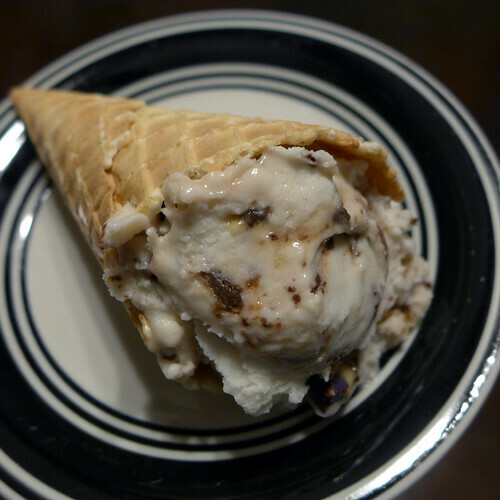 Nevertheless, I did experiment with two recipes prior to writing this review: Chai and Chocolate Pecan. 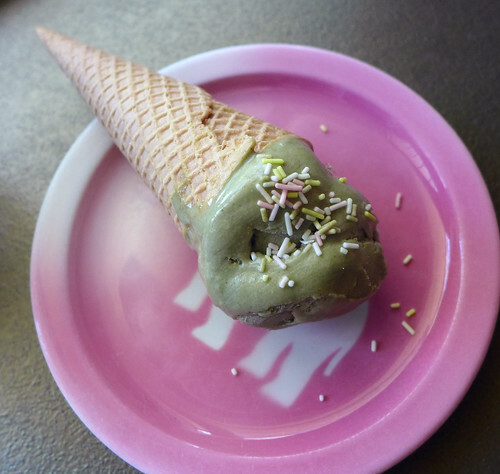 Kiss Me Organics Matcha Review – and a Vegan Green Tea Ice Cream Recipe! 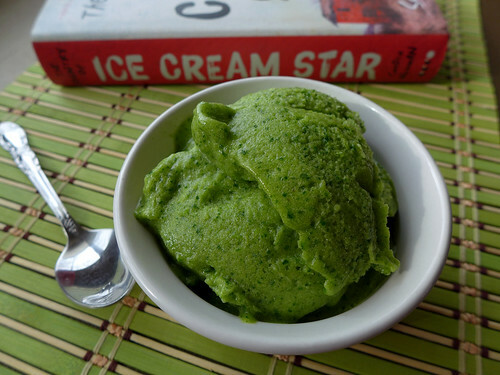 Green Tea Ice Cream, Anyone? 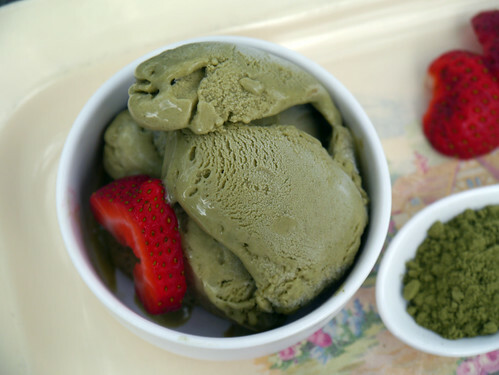 I love green tea, but due to its cost, I primarily use matcha powder for cooking and baking (ice cream and pastries, mostly). The matcha sold by Kiss Me Organics is comparable to other brands of matcha I’ve tried, with a vibrant green color; a fine, powdery consistency that’s not terribly difficult to whisk into liquids; and a rich taste that’s impossible to describe, except to say that it tastes like a good cup of plain green tea. 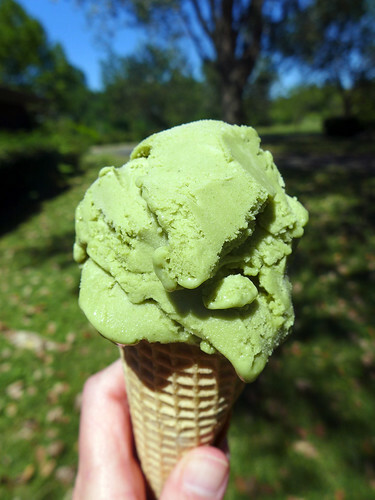 The day I received my order, I whipped up a quart of green tea ice cream (recipe below); I was impressed with the smooth consistency and complex taste imparted by the matcha powder. If you’re new to matcha, you can use it to flavor a variety of baked goods: add to your favorite vanilla cupcake mix, buttercream recipe, or even just mix a bit with powdered sugar and soy milk to make icing. There’s an excellent recipe for Green Tea Cupcakes on the Post Punk Kitchen (Google “Green Tea Cupcakes With Almond Flowers”), as well as a Matcha Truffles recipe from My Whole Food Life that I’ve been meaning to try. And don’t even get me started on Soy Division’s Matcha Glazed Vanilla Bean Donuts with Matcha Cream Filling! Ozera Ice Pop Molds: Product Review & A Strawberry Fruit Bar Recipe! Healthy popsicles at a fraction of the cost! I make a ton of ice cream during the summer months – banana and soy-based, mostly – but haven’t spent a whole lot of time experimenting with popsicles. I think these “groovy” ice pop molds from Ozera might just be a game changer! One set consists of six pop molds and a tray to keep them all upright. They molds are packed pretty tidily into the tray, so that it takes up minimal space in the freezer. (The tray measures about 5 ½” by 6”; I don’t know where the 7 x 5 x 8 inches in the product description comes from, since it’s not even an inch high.) While I’ve only had my molds for about a week, they seem sturdy and durable enough. The tops/handles fit snugly into the molds, and the molds in turn fit snugly into the tray. The set is dishwasher safe, but almost as easy to wash by hand. The directions on the box are riddled with typos (I think the company is German, and the atrocious copy is due to comically poor translation), but the molds are easy enough to use: just fill with a popsicle mix (recipes not included), leaving ½” of space at the top. Freeze for four hours and then enjoy!